Usually my children are happy to accept fruit as a dessert. Recently at a BBQ, I had plenty of extra dip ingredients. I thought I would give a sweet dessert dip a try, and boy was I glad I did! This dip takes fruit to the next level. The taste is reminiscent of a sweet New York cheesecake. It really makes fruit special. ​I used apple slices and fresh Ontario strawberries as dippers but use whatever fruit you like. I think peaches will be great once they’re in season. ​All you need to make this amazing dip are a few ingredients and a hand mixer (or a whisk if you like working your arms!). It can be made low fat by using lower fat versions of the ingredients. It comes together in a snap and waits in the fridge until you’re ready for dessert. ​Add all ingredients to a bowl. Serve in a bowl with your favourite fruit or dipper. See below for full fat and low fat nutritional information. ​Have you met the Collins family? ​Brothers Tom, John and Juan, have been intoxicating people since the 1800s. Back in the 1800s people didn’t consume nearly the amount of added sugar we do today, so a drink recipe containing simple syrup wouldn’t put people into sugar overload. ​A classic Collins contains lemon juice, simple syrup, soda water and alcohol (Tom Collins=gin, John Collins=Whiskey, Juan Collins=tequila, bonus: Vodka Collins=vodka but he didn’t fit my “brother” analogy ¯\_(ツ)_/¯). Given the amount of hidden sugar we consume, I gave this recipe a sugar free makeover. ​It’s as easy as whisking the Spoonable Monk Fruit with lemon juice and alcohol, then topping up with ice and soda water. Feel free to adjust the sweetness to taste. ​Whisk Sweet Cheat Spoonable Monk Fruit with lemon juice and gin. Add ice to glass and top with soda water. One of my kids’ favourite go-to desserts is popsicles. It could be the middle of February and well below freezing out and they would gladly have a popsicle for dessert. The problem with store bought popsicles is the amount of added sugar they contain. Sugar is often the second ingredient after water. In fact, one brand I was looking at listed; water, sugar, corn syrup, glucose-fructose, and then dextrose. As a treat, fine, but my kids will eat popsicles every day. I created this recipe so I could say “yes” when they ask. ​The strawberries have naturally occurring fructose, but since they also have fibre, they won’t spike your blood sugar the same way fruit juice or added sugar will. ​I blended the ingredients because one of my kids is resistant to chunks, but you can just chop the strawberries if you prefer. Feel free to use whatever milk you like, I used cashew milk to keep it low carb for those of you counting carbs. Add ingredient to blender and blend until smooth. ​After creating the recipe for Sweet Cheat Frozen Hot Chocolate, I got a lot of comments from people loving the “grown up” version with Irish Cream. That got me to reminiscing about the Frozen Mudslide drinks I drank in University. The original recipe calls for both Kalua and Irish Cream. Delicious, however not low sugar by any stretch of the imagination. I thought there had to be a way to create a low carb, no sugar version. Guess what, I did it!!! ​​As excited as I am about this recipe, I figured that people following a keto, or other low carb diet would love it too. It’s only 1g net carb! All this one takes, is a few ingredients and a blender (or not, if you prefer no slush). ​Combine. Mix or blend. Drink. Slush version: Add ingredients to blender. Blend. No Slush: Whisk ingredients and pour over ice. ​Today it’s hotter than the surface of the sun. I know my kids are going to ask for ice cream when they come home from school. Ice cream is something I definitely let them enjoy as a treat, but in the hot months, it seems like they think everything is a great excuse for it. I know that I can tempt them with frozen hot chocolate instead. ​This recipe is slushy enough to enjoy with a spoon, sweet enough to satisfy your sweet tooth, and cold enough to combat the heat! The great thing about it is that it can be made low carb or keto friendly or dairy free, or even a grown-up treat with Irish Cream if that’s what you like! Start with Sweet Cheat Chocolate milk powder, milk, cream and ice. This is the part where you can customize, diary free milk and coconut cream will lower both the carbs and remove the diary. ​Put everything into a blender and pulverize. Put everything into a blender. Blend and pour. One of the questions I often get is if Sweet Cheat Spoonable Monk Fruit can be used for baking. The short answer is “Yes…but”. Sugar is a tricksy thing to replace. Chemically it does a lot for baking (think inhibiting gluten formation, retaining moisture, adding bulk…the list goes on). The good news is that with the right recipe you can still use Sweet Cheat Spoonable Monk Fruit to get a tender delicious muffin with no added sugar. This is just such a recipe. It’s easy enough to whip up on a Saturday morning, or before the kids come home from school. The best part is, that it has 0g of added sugar, but you'd never know by the taste. I think it’s perfect! ​As with most recipes, you mix the wet ingredients together. Mix the dry (this is where the Sweet Cheat Spoonable Monk Fruit goes). Add the dry ingredients to the wet, and don’t over mix! ​Spoon into a greased or lined muffin tin, and bake for 20 minutes at 350 F.
​No one will guess that these muffins are free from added sugar! Try them and see for yourself. 1. Preheat oven to 350 degrees F. Prepare a muffin tin with liners or non-stick spray. 2. In a large mixing bowl, mix Sweet Cheat Spoonable Monk Fruit, flour, baking powder, baking soda, and salt, then set aside. 3. In a separate bowl, mix the mashed bananas, melted butter, milk, egg and vanilla. Add wet ingredients to the dry ingredients and mix until just incorporated. Don’t overmix. 4. Scoop batter into prepared muffin tin. Bake for 20 minutes or until a toothpick inserted into the centre of muffins comes out clean. *muffins can be made gluten free, diary free, or egg free. Use 1:1 gluten free flour, non-dairy milk, melted coconut oil, and egg replacer. Most of us know that sugar isn’t great for us. Companies know it tastes great, makes the chemistry of baking work, keeps bacteria from growing, and keeps us buying. So how to get an increasingly health aware public to keep buying sugar laden products? Call it “Dehydrated Wizard Tears” if you want to, you can’t fool your body. Sugar is sugar. 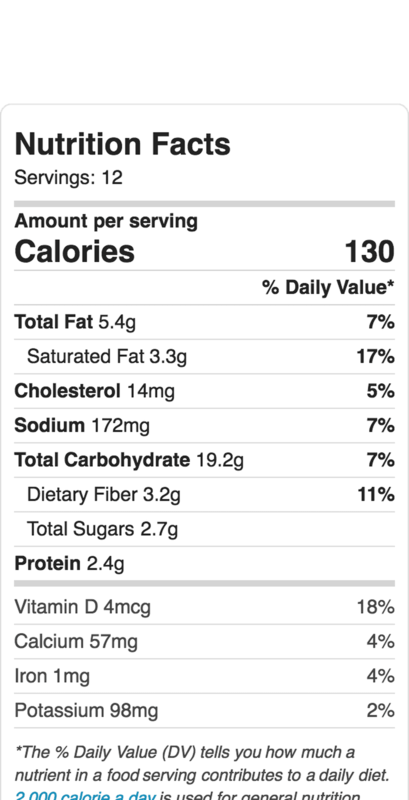 Legally, ingredients need to be listed by weight on nutrition labels. If you made a label for the scrambled eggs you made for breakfast, it would read; EGGS, MILK, BUTTER, SALT. Based on this label, you know that in the mix eggs are the biggest percentage and salt is the lowest. The way companies can make it look like there is less sugar in their products than there actually is, is by using more than one kind of sugar, like both white sugar and “dehydrated coconut nectar”. A muffin mix could contain 50g of flour, 40g of white sugar, and 30g of dehydrated coconut nectar. There is more total sugar in the mix, 70g, than there is flour, 50g. Yet, the company can make the label like this; FLOUR, WHITE SUGAR, DEHYDRATED COCNUT NECTAR, making it appear that the mix is mostly flour. There is a misconception that everything natural must be healthier. Sometimes this is true, sometimes it’s just spin. Take “concentrated fruit juice” for example. Fruit is healthy right? When you take juice from an apple and boil it down, you get a syrup, then crystals (sugar). When you take liquid from a plant called a sugar beet, you get a syrup, then crystals (sugar). It’s the same thing, but “concentrated fruit juice” sounds healthier than “sugar” and is used as a way to fool people into thinking the product containing is actually healthier. It isn’t! In Canada, nutrition labels are changing to help people make better choices. Over the next 5 years, companies will have to change their nutritional labels to tell people how much total sugar there is in products. Take our muffin mix example, the ingredient lists will have to look like this; SUGARS (WHITE, DEHYDRATED COCONUT NECTAR), FLOUR, letting you know that the mix is mostly sugars. In the united states, labels will have to list “added sugars’ on the nutritional panel. Until all companies have become compliant with the new rules, make sure you really read and understand labels. What is this monk fruit you speak of?! ​When I started trying to replace the sweetness of sugar with healthy, natural alternatives, I started with stevia. I was pregnant with my fourth tiny toad and I had gestational diabetes. Not one to consider giving up baking, I searched for the most natural sugar replacer available. Long story short, I ruined a lot of good baking with a sweetener my super pregnancy senses said “Hell no!” to. Enter Monk Fruit. Monk fruit, also known as luo han guo, is a gourd grown in Southeast Asia. It got its name because its first mention was in the records of 13th century Chinese monks. It has been used in traditional Chinese medicine since then. It has no calories and since it is 300x sweeter than sugar, you only need to use a small amount. That sweetness comes from an antioxidant called mogroside V, which laboratory studies have shown to prevent oxidative damage to cells, and exhibit anti-diabetic and anti-carcinogenic effects (Phytochemical and pharmacological aspects of Siraitia grosvenorii, luo han kuo, Jin and Lee 2012). Had I known about monk fruit while I was pregnant, I could have enjoyed some sweet treats without worrying about spiking my blood sugar. ​What’s amazing about the monk fruit we use at Tiny Toad Creations is that it is vegan (most other monk fruit is extracted using gelatin), and has no aftertaste. I formulated our first product, the Universal Muffin Mix, with stevia. I could taste it, and for 10% of my product testers, it was a deal breaker for enjoying the muffins. Not good enough. I searched for an alternative and sourced a monk fruit powder that is undetectable, other than being sweet. The secret ingredient for this magical monk fruit is the “natural flavours” you see on our ingredient lists. The monk fruit we use is sprayed with the juice from organically grown and cultivated mushrooms. What this does is block the bitter receptors on the back of your tongue and eliminate the aftertaste you notice with other monk fruit products.